HÀ NỘI — Shares slowed down during Thursday afternoon’s trade but still closed higher thanks to rallies of several major stocks and strong buys by foreign traders. The VN-Index inched up 0.08 per cent to close the session at 860.40 points on the HCM Stock Exchange, a new 10-year peak, following strong growth of VinGroup (VIC) and Vinamilk (VNM). This was also the index’s fifth consecutive rising session with cumulative gains of 3.3 per cent. 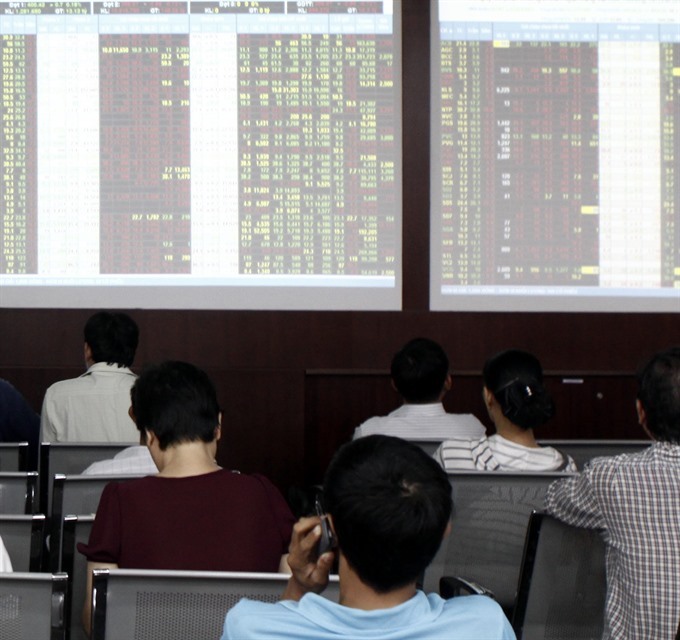 On the Hà Nội Stock Exchange, the HNX-Index was up 0.12 per cent at 105.87 points. Liquidity remained positive with a total of 197.3 million shares worth a combined VNĐ5.1 trillion (US223.4 million) traded in the two markets. VinGroup, Việt Nam’s biggest private real estate developer, climbed 4.7 per cent, while the largest stock by market value, Vinamilk, increased 1.4 per cent. Shares of VinGroup have rallied about 50 per cent in the last three months, partly thanks to debut of its retail arm Vincom Retail (VRE) which began trading on the HCM Stock Exchange on Monday. Ending September, the company recorded revenue of VNĐ57 trillion and net profit of VNĐ2.1 trillion, up 67 per cent and 23 per cent year-on-year, respectively. Other substantial gainers on Thursday included Bình Minh Plastics (BMP), up 3.6 per cent; Petrolimex (PLX), up 2.3 per cent; budget airline Vietjet Air (VJC) and Mobile World Group (MWG), up by less than 1 per cent. All of them are among top 30 largest stocks by market value on the HCM City’s bourse. Divergence was remarkable, however, with many big shares sinking into the red, including VPBank (VPB), Vietcombank (VCB), brewer Sabeco (SAB), steelmaker Hoa Sen Group and FLC Faros Construction (ROS), of which ROS was the biggest loser, down 6.8 per cent. Overall market condition was negative with losing stocks outnumbering gaining ones by 235-212, and 273 closed flat on the two markets. Thursday’s highlight was active trade by foreign investors which supported the market. They were responsible for net buy volume of 4.8 million shares worth VNĐ363 billion in HCM City’s market. They focused on Vinamilk’s shares with net buy value of VNĐ278 billion, followed by Vietjet Air with VNĐ43 billion. Foreign investors were also net buyers in Hà Nội’s market for 1.4 million shares worth VNĐ24.3 billion. However, according to BIDV Securities Company, the market was in an unpredictable phase as the intra-day fluctuation in the session was gradually widening.